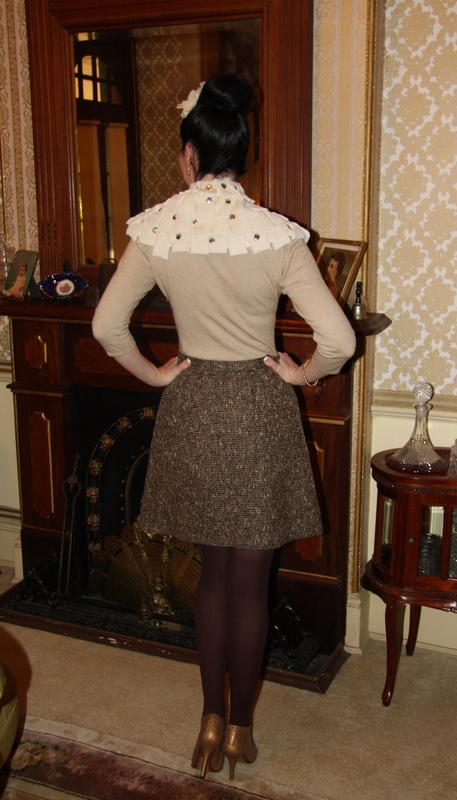 Outfit: Stone coloured three-quarter sleeve knit, worn with A-line skirt with inverted front pleat in chocolate and gold boucle wool. Shoes: Gold embossed leather ankle bootees. Hair: Worn in a ballerina bun with a cream and gold floral clip. Accessories: Faux fur collar with silver stud trim, chocolate brown opaque tights, rose gold Euroball earrings, rose gold curb bracelet.